Over the weekend, we had the pleasure of hosting the Napa chapter of The International Wine and Food Society (IWFS) at Monticello for a tasting and lunch. IWFS was founded by a fellow named Andre Simon in London in 1933 and has expanded to international membership with nearly 5000 members in 87 different chapters. You can learn more on their website at www.iwfs.com. 38 of those 5000 members visited us at Monticello on Saturday afternoon for a five year vertical tasting of our CORLEY Proprietary Red Wine, vintages 2002-2006. Since we debuted the CORLEY PRW in 1999, this wine has been a big hit, and a lot of fun for us to put together at the blending table. It is a Cabernet Franc based cuvee, with Merlot, Cabernet Sauvignon, and in recent vintages, small percentages of Syrah blended in. It's also an interesting to taste vertically with a group like this. Because it encompasses three, sometimes four varietals, the general characteristics of each vintage are showcased well in this flight. The CORLEY is also a great wine to taste to get a sense of the overall fruit that we're growing on the property, as it represents all of the red varietals that we grow (with the exception of Pinot Noir). After our tasting in the cellar, the group enjoyed a fantastic Paella lunch on the terrace of the Jefferson House, prepared by Gerard Nebesky and Anna Ming of Gerard's Paella, www.gerardspaella.com. We have had Gerard out to Monticello to prepare lunches and dinners for us many times. He never fails to excite. Absolutely delicious, and perfectly prepared with no corners cut. Gerard was the proud winner of his Throwdown with Bobby Flay in Season 5. We'll be looking forward to our next opportunity to have Gerard back to Monticello, and hope that we'll see our friends from The International Wine and Food Society soon as well ..."
Rodolfo has worked with Monticello for nearly 20 years. He began with us working in the field around 1990. Rodolfo spoke little English when he started at Monticello. 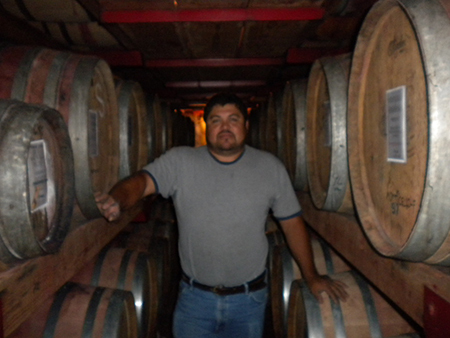 After four seasons in the field, Rodolfo expressed an interest in shifting over to the cellar. Our winemaker at the time, John McKay, provided Rodolfo with the opportunity to work in the cellar, and Rodolfo has been working in the winery every day since. Over the last 16 years in the cellar, Rodolfo has consistently improved his cellar and winemaking skills. Rodolfo has gone from working in the field and speaking little English to managing our cellar and production staff, overseeing the bottling line, interacting with custom clientele, running lab analysis and generally helping out wherever necessary. There was a stretch of a few years in the mid 1990s when Rodolfo was responsible for our gardens at Monticello, and would spend one day a week tending to the garden. We were all impressed with his abilities and care in the garden as well. A natural green thumb. And always with a smile. From time to time, we'll have a carne asada cookout on the crush pad. Rodolfo makes some great salsas and is very talented in the kitchen as well. Away from work, he enjoys dancing, fishing and spending time with his family. I remember when Rodolfo first started working in the cellar in 1993. We have worked together up through the ranks of the cellar, from the bottom to the top, literally shoulder to shoulder, and will share our 16th harvest together at Monticello in 2009. In all the time I have worked with Rodolfo, I have never seen him lose his temper, nor even raise his voice. He rarely misses a day of work, and is the most dependable person I have ever worked with. I'm immensely proud to work with Rodolfo, and hope that we can continue working side by side for many more years!